For an outline of all engines used by AMC, see List of AMC engines. OHV 2 valves x cyl. American Motors Corporation (AMC) designed and manufactured three distinct V8 engine designs. Their first V8 engine design was made from 1956 through 1967. Their second design debuted in 1966 and was made through 1991, although modified to become a 3rd generation, with a taller deck in 1970. Chrysler kept the last design in production until 1991 for the Jeep Grand Wagoneer. This was AMC's first V8 engine designed and manufactured from 1956 to 1967. American Motors' president, George W. Mason, negotiated a verbal agreement with Packard that the two companies would supply parts for each other when practical. This was a prelude to a possible merger of the two companies at a later date, but that never occurred. 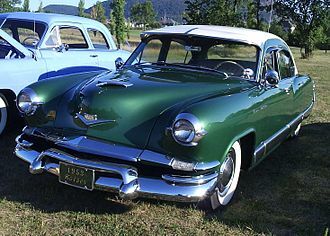 With the industry-wide acceptance of V8 engine designs after World War II, AMC started buying Packard V8s in 1954 for the 1955 Nash Ambassador and Hudson Hornet. 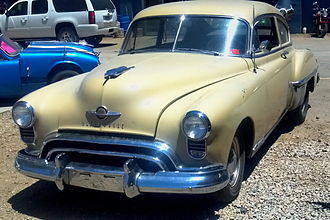 These were supplied with Packard "Ultramatic" automatic transmissions - exclusively. Packard sent AMC some parts bids, but these were rejected as too expensive. George W. Romney, AMC's new head, decided against further relationships with Packard shortly after entering the position of CEO in October 1954 after Mason's sudden death. Romney ordered his engineering department to develop an in-house V8 as soon as possible. The engineering department hired David Potter, a former Kaiser Motors engineer, to help develop the engine. Potter had previously worked on a V8 design for Kaiser, and they were able to get the all new V8 into production in less than 18 months. All these engines share common external dimensions, light weight - about 600 lb (270 kg) - forged crankshaft and rods, as well as most other parts. The stroke for all Gen-1 V8s is 3 1⁄4 inches (82.6 mm). Engine displacement was a factor of the bore: the 250 cu in (4.1 L) has a 3 1⁄2 inches (88.9 mm) bore, 287 cu in (4.7 L) 3 3⁄4 inches (95.3 mm), and the 327 cu in (5.4 L) a 4 inches (101.6 mm) bore. The bore size on the 327 is cast on the top of the block near the back of the right bank cylinder head and is denoted by a '4'. The 250 and 287 engines do not have the bore size cast into the block. The block features a deep skirt where the casting extends below the crankshaft centerline, forming a very rigid crankcase gallery. The oil system feeds a central gallery to the cam and crankshaft first from front to rear, and then dividing at the front to feed the two lifter galleries from front to rear. From the rear of the two lifter galleries oil is then supplied up to the two rocker arm shafts which serve as galleries to lubricate the valvetrain. The fore and aft direction changes are designed to eliminate stale oil areas which tend to form sludge deposits. 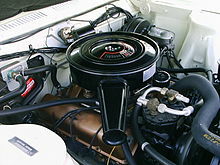 American Motors' first V8 in-house engine, the 250, was used in AMC automobiles from 1956 through 1961. 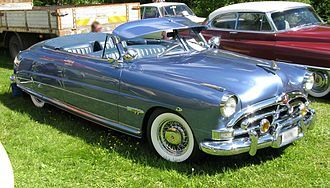 It was a modern OHV/pushrod engine design and made its debut in the Nash Ambassador and Hudson Hornet "Specials" of 1956. These cars had the top-of-the-line model trim, but were built on the shorter wheelbase (Statesman and Wasp) models (hence the "Special" name). The 250 uses solid lifters and came in two- and four-barrel carburetor varieties (4V only in Nash/Hudson "Specials"). The 250 V8 was optional in the 1957 Rambler. 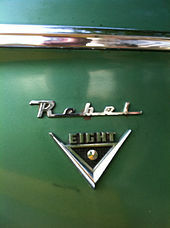 All 1958-60 V8 Ramblers were called "Rebels" and designated as a different series. It is easy to confuse the 1957 Rambler V8 and the 1958-'60 Rebel line with the special 1957 Rambler Rebel, a limited edition muscle car (see 327 below). In 1961, The Rambler Six was renamed the "Rambler Classic" to avoid model confusion in the Rambler line-up. A V8 engine then became an option in the Classic instead of a separate model. In mid-model year 1963, AMC introduced a 287 cu in (4.7 L) V8. When the 250 was dropped in 1961, there was no V8 option for Rambler models other than the top of the line Ambassador, which was only available with the 327. Dealers complained, so the 287 was introduced as an option for the "mid-size" Rambler. Like the 327, it uses hydraulic valve lifters. Only two-barrel models were produced, there were no four-barrel options from the factory for the 287 as this was the economy model V8. The 287 engine was produced through the 1966 model year. The AMC 327 V8 debuted in the 1957 Rambler Rebel, an early "muscle car"
The AMC 327 is similar to the 287, but displaces 327 cu in (5.4 L) due to the bore increase to 4 inches (101.6 mm). Unlike the 250, the 327 was produced with hydraulic valve lifters. Contrary to some myths, the AMC V8 was not built by Chevrolet, whose own 327 V8 later became better known. The AMC 327 was introduced five years before the Chevrolet 327 engine was manufactured. 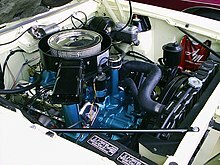 The AMC 327 engine debuted in a special edition Rambler Rebel, of which 1,500 were made. They were an early American muscle car. All Rebels had silver paint with a gold-anodized "spear" on each side. The 327 was not available in any other Rambler models in 1957 other than the special edition Rebel. 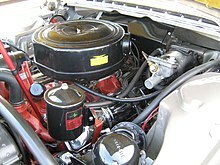 The Rebel's engine differs from the 327s installed in the 1957 Nash Ambassador and Hudson Hornet models in that it uses mechanical valve lifters and a higher compression ratio. Since both engines were rated at 255 hp (190 kW; 259 PS), it is probable that the Rebel's was underrated. The Nash Ambassador and Hudson Hornet "Special" models were dropped after 1957, replaced by the 1958 Rambler Rebel with the 250 V8. The Rebel was a Rambler with a V-8 (and necessary mods such as stronger front springs and rear axle). The Rebel name was added to differentiate the standard six-cylinder Rambler from the V-8 model. The big Nash and Hudson cars were also dropped after 1957, replaced by the 1958 "Ambassador by Rambler" — a stretched Rebel with the 327 V8 instead of the 250. The 327 was exclusive to the Ambassador line and could not be ordered in a Rebel (or later Classic) through 1964. For 1965 and 1966 the 287 and 327 were both available in the Classic and Ambassador. The 327, with two barrel carburetor only, was sold to Kaiser-Jeep from 1965 to 1967 for use in the Jeep Wagoneer SUV and Gladiator pick-up truck. Jeep named it the "Vigilante" V8. Kaiser-Jeep switched to the Buick 350 in 1967 after AMC discontinued the 327. 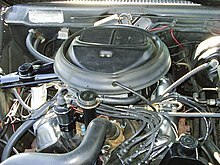 The Buick V8 engine option continued through 1971 after which Jeeps returned to AMC V8 engines, American Motors having purchased Jeep from Kaiser in 1970. There were low- and high-compression versions of the 327 starting in 1960. Prior to 1960 all 327s were high compression. All low compression models used a two-barrel carburetor and all high-compression models received a four-barrel carb. 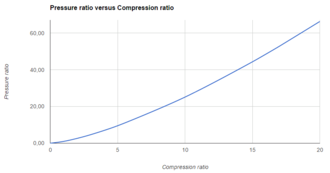 Low-compression is 8.7:1, high 9.7:1, effected by a difference in pistons. 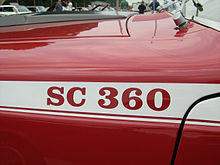 The 327 was also offered as a marine engine as the "Fireball" by Gray Marine Motor Company. The AMC 327 was to be the first commercial electronic fuel injected (EFI) "Electrojector" production engine. Press reports about the Bendix-developed system in December 1956 were followed in March 1957 by an AMC price bulletin offering the EFI option on the Rambler Rebel for US$395, but due to supplier difficulties, fuel-injected Rebels were only available after June 15. Teething problems with the Electrojector unit meant that only a few engineering and press cars were built, estimated to be no more than six units. At least two pre-production Rebels with EFI, however, are known to have been built. One was sent to Daytona Beach, Florida for "Speed Week" (the forerunner of today's Daytona 500). It was the second fastest car on the beach, bested only by a 1957 Chevrolet Corvette with mechanical fuel injection, and only by a couple tenths of a second. The EFI 327 was rated at 288 hp (215 kW; 292 PS) and the regular four-barrel carbureted model at 255 hp (190 kW; 259 PS). The EFI system in the Rebel was a far more-advanced setup than the mechanical types then appearing on the market and the engines ran fine in warm weather, but suffered hard starting in cooler temperatures. All the EFI cars were reportedly converted to four-barrel carbs before being sold; none are known to have existed outside the engineering department at AMC. The main problem was that early electronics were not fast enough for "on the fly" engine controls. This setup was utilised by Chrysler for the 1958 model year on its Dodge, Chrysler, Plymouth, and DeSoto carlines. It too failed, having the same problems. Bendix licensed patents based on their 1950s design (patent dated 1960) to Bosch, who perfected it as the basis for their D-Jetronic, et seq. injections system, first used in 1967. The 250 and 327 were also offered as a marine engine known as the "Fireball" by Gray Marine Motor Company starting in 1958. Gray started offering the 250 in 1959. The 250 was offered in 135, 160, 170, 175, 178 and 185 horsepower versions. 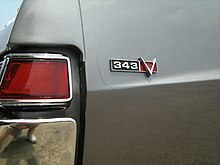 The 327 was made in 188, 215, 220, 225 and 238 horsepower levels. Gray used the 250 through 1966. The 327 was used as a 220 hp model in 1967, the last year an AMC V-8 was used. The new-generation AMC V8 was first introduced in 1966. It is sometimes referred to as the "Gen-2" AMC V8. The first version was the completely new 290 cu in (4.8 L) Typhoon V8 introduced in a special mid-1966 model year "Rogue" hardtop. Available in 200 hp (149 kW; 203 PS) two-barrel carburetor version or producing 225 hp (168 kW; 228 PS) with a four-barrel carburetor and high compression, the new engines utilized "thin-wall" casting technology and weighed only 540 pounds (245 kg). All three engine sizes - 290 cu in (4.8 L), 343 cu in (5.6 L), and 390 cu in (6.4 L) - share the same basic block design—the different displacements are achieved through various bore and stroke combinations. All blocks share the same external measurements and thus can be swapped easily. Bore center measurement was kept the same as the Gen-1 V8 at 4.75 in (120.7 mm) so that boring equipment could be reused. Other than that, this engine is vastly different from the Gen-1 model. The Gen-1 engine is physically the size of a big-block Ford or GM engine, and is sometimes called a "big-block". The Gen-2 is closer to the physical size of U.S. made small-block V8s except for the bore centers, which are the same as some big-block engines. The only parts shared between the 1966-67 Rambler V8 and 1966-91 AMV8 are the lower cam timing sprocket and the timing chain. The AMC V8 was not built by Ford or anyone else although it bears an uncanny resemblance to the later Buick V8 engines (400, 430, 455). It shares the same design employing a timing gear case that mounts both distributor and oil pump. It also shares the same oiling scheme employing a single passage to feed both cam and crank from the right lifter bank by tangentially intersecting the cam bore instead of two drilled passages, one from the cam to crank and another from the crank to the right lifter bank. Some electrical parts (starter and distributor) were shared with Fords, and some models used Motorcraft (Ford) carburetors, but the balance of the engine design is unique. The Gen-2 AMC V8 was first introduced at 290 cu in (4.8 L) in 1966. It was used exclusively in the Rambler American model the first year. The 343 cu in (5.6 L) came out in 1967 and the AMX 390 cu in (6.4 L) arrived in mid-1968. These engine blocks were unchanged through the 1969 model year. The head used during this time was the so-called "rectangle port", named after its exhaust port shape. The 290 heads use smaller valves, 1.787 in (45.4 mm) intake and 1.406 in (35.7 mm) exhaust, in order to prevent problems with the small bore. The 343 and the AMX 390 use the same larger valve heads, 2.025 in (51.4 mm) intake and 1.625 in (41.3 mm) exhaust. From 1976 to 1979, Jerry Grant "drove the most powerful car ever to appear in Indy car racing" - a turbocharged 209 cu in (3.4 L) stock two-valve AMC Gen-2 block V8 engine producing 1,100 hp (820 kW; 1,115 PS) in his Eagle 74 chassis. The car was fast on the straightways, but the engine's weight made corners more difficult to handle. The engine utilized a 3 3⁄4 in (95.3 mm) bore and a flat plane 2.36 in (59.9 mm) stroke crankshaft. The base 290 cu in (4.8 L) produces 200 or 225 hp (149 or 168 kW) with a two-barrel or four-barrel carburetor, respectively. It was built from the mid-1966 model year through the 1969 model year. It has a bore and stroke of 3 3⁄4 in × 3.28 in (95.3 mm × 83.3 mm). Only 623 cars were built in 1966 with the 290 engine. These engines were available in special Rambler American two-door Rogue models. The newly powered Rogue was available with either a three-speed automatic or a floor mounted four-speed manual transmission, and made the car "suitable for the Stoplight Grand Prix." The 343 cu in (5.6 L) has a bore and stroke of 4.08 in × 3.28 in (103.6 mm × 83.3 mm). The basic 343/2V produced 235 hp (175 kW; 238 PS) and was built from 1967 through 1969. Output for the optional four-barrel carburetor version is 280 hp (209 kW; 284 PS) and produces 365 lb⋅ft (495 N⋅m) of torque (gross). This version has a 10.2:1 compression ratio. In addition to the largest bore and stroke, the 390 cu in (6.4 L) AMX motor also received heavier main bearing support webbing and a forged steel crankshaft and connecting rods. Forged cranks and rods were used for their known strength—there was inadequate time for testing cast parts for durability without delaying AMC's introduction schedule. Once forging dies were made it was not cost effective to test cast parts due to the relatively low number of engines produced. The use of these stronger components was also continued with the production of 401 engines. This is an advantage of these AMC engines when used in heavy-duty and high-performance applications because they have no problems with their rods breaking; unlike other domestic automakers' large displacement small block engines. The Gen-2 AMX 390 produces 315 hp (235 kW; 319 PS) and was built in 1968 and 1969. Bore and the stroke is 4.165 in × 3.574 in (105.8 mm × 90.8 mm). Maximum factory recommended overbore is only 0.02 in (0.51 mm), although they are commonly bored 0.03 in (0.76 mm). In 1970, AMC changed the head to the "dog-leg" exhaust port design. In 1970, all three blocks grew in deck height and gained a new head design. These changes made this the third generation of AMC V8, hence it is sometimes referred to as the "Gen-3" AMC V8. The stroke and deck height on the 290 and 343 was increased by 0.16 in (4.06 mm) on both engines, becoming the 304 cu in (5.0 L) and 360 cu in (5.9 L), respectively. The 1970 AMX 390 remained at the same displacement by using a special rod and piston for this year only. It is believed that AMC kept the 390 this last year due to the reputation it had garnered in the two seater AMX, which was discontinued after 1970. In 1971 the 390 was also stroked by 0.16 in (4.06 mm) to become the 401 engine. The other change in 1970 was the switch to the "dog-leg" heads. These heads flow 20% better on the exhaust side than the 1966-1969 rectangular port heads and are thus the best for performance. There are two reasons for the flow increase: (1) the area of the port is larger, due to the dog leg and (2) the shape of the port floor was changed from a concave to a convex curve. The concave floor tended to bend the exhaust flow upwards which caused turbulence when the flow was forced to go down into the exhaust manifolds. By switching to a convex floor the curvature of the flow starts in the head and proceeds much more smoothly into the exhaust manifold resulting in less turbulence and better flow. The center two intake bolts on each head were relocated to prevent accidental mix-ups of Gen-2 and Gen-3 intakes. The intakes can be interchanged by slotting the bolt holes, but the added deck height of the GEN-3 engine means that sealing and port match will be compromised. Gen-3 intakes can be machined to fit Gen-2 engines by surface grinding the intake flanges and slotting the center holes. There is a persistent myth about 1970-mid 1971 319 and 291 AMC heads. These heads have the dog-leg exhaust ports and 50-52 cc combustion chambers. They are commonly identified by the first three (319) or last three (291 for the 360-401 heads; 304 used a different casting) digits of the casting number. There was a U.S. auto industry-wide shift to lower compression ratios in mid 1971, so AMC increased combustion chamber size to 58-59 cc. The first three digits of the casting number on the large chamber heads are 321, 322, or 323 depending on year. The only difference between small and large chamber Gen-3 heads is the combustion chamber size. The advertised power drop from 1971 to 1972 ('71 304/210hp and '72 304/150hp, for example) is not due to any engine change, but to in the way the automobile industry adopted SAE power rating method. The 1971 and 1972 engines produce the same power. The 1971 and earlier versions were rated using "gross" horsepower, which is with the engines operating with no accessories or drive belts, air filters, nor any exhaust system restrictions. The change to the more realistic "net" horsepower ratings for 1972 and later required the engine to be driving all stock factory accessories and to use the factory air filter system and a simulated factory exhaust. Power is measured at the flywheel for both systems. 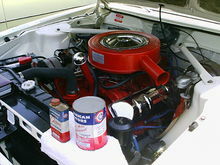 For example, even with the modifications to more reduce emissions and increase efficiency, AMC's 401 cu in (6.6 L) engine was among the strongest factory-spec engines available in an American car in 1971, with more horsepower than Pontiac's standard 455 cu in (7.5 L) and Chevrolet's 454 cu in (7.4 L) that powered the Corvette. The 304 has a displacement of 304 cu in (5.0 L) which produced 210 hp (157 kW; 213 PS) in 1970-71 and was built starting in 1970. Later models produced less power from the factory, going down yearly. 1972-75 models were rated at 150 hp (112 kW; 152 PS). It was rated at 130.5 hp (97 kW; 132 PS) in 1978, and 125 hp (93 kW; 127 PS) in 1979, the last year it was installed in passenger cars, and in 1980-81, the last years it was used in Jeep vehicles. 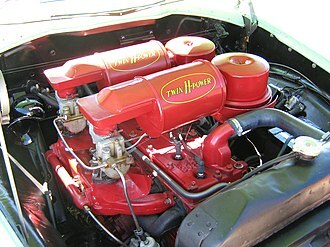 The International Harvester Corporation 304-cubic-inch (5.0 L) SV "Comanche" V8 engines are sometimes mistaken for the AMC 304, however the IHC V8 engine family has no relation to the AMC V8 and was in fact first produced in 1959,11 years prior to the AMC designed 304. 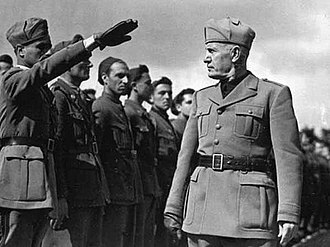 The similarity in displacement is purely a coincidence. The AMC 360 has a displacement of 359.80 cu in (5,896.1 cc). The 2-barrel produced 235 hp (175 kW; 238 PS) to 245 hp (183 kW; 248 PS) in 1970 to early 1971 while the 4-barrel produced 285 hp (213 kW; 289 PS) to 295 hp (220 kW; 299 PS), 175 hp (130 kW; 177 PS) to 220 hp (164 kW; 223 PS) from mid-1971 to 1975, 140 hp (104 kW; 142 PS) to 180 hp (134 kW; 182 PS) in 1976, 129 hp (96 kW; 131 PS) in 1977, and 160 hp (119 kW; 162 PS) from 1978 to 1991. 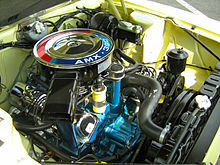 This engine was used in the 1970 AMX as the base engine and also in the 1970 Rebel, 1971-1978 Matador, Jeep J-series trucks 1970-1987, Wagoneer (SJ) models from 1972 to 1984, Cherokee (SJ) from 1974 to 1983, as well as in the full-sized Grand Wagoneer from 1984 to 1991 - becoming the last carbureted engine used in an American-built vehicle. The 360 V8 was also installed in the Bricklin SV-1 sports car for 1974 model year. The 360 was the last AMC V8 to be manufactured. It continued to be produced after Chrysler bought American Motors in 1987 as the standard engine in the Jeep Grand Wagoneer through 1991, with the only modification being the "360" casting replaced with "5.9L" on the side of the block. The 390 cu in (6.4 L) AMC V8 produced 325 hp (330 PS; 242 kW) and 420 lb⋅ft (569 N⋅m; 58 kg⋅m) of torque in all except the Rebel Machine. This muscle car engine was rated at 340 hp (345 PS; 254 kW) and 430 lb⋅ft (583 N⋅m; 59 kg⋅m) of torque due to a different intake. Production only lasted one year (1970) before it was stroked to become the 401 cu in (6.6 L). Like the Gen-2, the maximum factory recommended overbore is only 0.02 in (0.51 mm), though they are commonly bored 0.03 in (0.76 mm). The 401.11 cu in (6,573.0 cc) produced 330 hp (335 PS; 246 kW) gross in 1971 and 255 hp (259 PS; 190 kW) net from 1972 to 1975. In 1976 it was rated at 215 hp (218 PS; 160 kW). Like the 390, the 401's crankshaft and connecting rods are forged steel. Like the 390, factory recommended overbore is only 0.02 in (0.51 mm), but commonly bored by 0.03 in (0.76 mm). It was last produced in 1979. 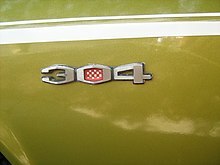 The 401 was available in the Javelin, Matador, and Ambassador car lines and in Jeeps from its introduction in 1971 through 1974. In 1975 and 1976, emission controls, insurance rates, and high gasoline prices meant the 401 was available on the large Matador model, and then only for police department orders. Buyers of full-sized Jeeps (Wagoneer, Cherokee, J-10 and J-20) could order a 401 until 1979. 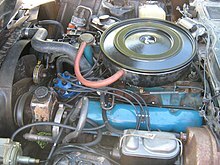 This engine was also supplied to International Harvester for use as an optional engine in International's Light Line pickup trucks and Travelalls from late 1973 through 1974. There was also a "Service Replacement" block made as a modified GEN-3 design. This is a 401 casting (same casting number) without the displacement cast into the side and with a 360 bore and thicker deck. In theory this single block could be built as any 343-401 GEN-2 or GEN-3 engine. A dealer could stock one or two blocks to use for warranty replacement. The main bearing web area was thicker in the 390, 401 and SR blocks, thick enough that two additional bearing cap bolt holes could be drilled and tapped for an aftermarket four bolt main cap, providing a stronger bottom end. AMC never built a factory four bolt main block, they sold aftermarket four bolt main caps through their Group 19 performance parts program. The SR block also sold as a heavy duty racing block. It appeared in 1970 in time for the 1971 Trans-Am racing season, and was used in the factory Trans-Am backed cars prepared by TRACO for Penske Racing, with Mark Donohue the primary driver. Since it was a standard factory part it did not have to be homologated under T/A rules, and was not used in the 2501 "Mark Donohue" Javelins built to homologate the "duck tail" spoiler. Those received standard 360 or 390 engines, buyers choice. ^ Mitchell, Larry (2000). AMC Muscle Cars. Motorbooks. p. 24. ISBN 978-0-7603-0761-8. Retrieved 20 August 2014. ^ "Personnel: Changes of the Week". Time. 25 October 1954. Retrieved 20 August 2014. ^ a b c d Gunnell, John (2006). Standard Catalog of American Muscle Cars 1960-1972. Krause Publications. p. 8. ISBN 978-0-89689-433-4. Retrieved 20 August 2014. ^ Frumkin, Mitch (2002). Classic Muscle Car Advertising: The Art of Selling Horsepower. Krause. p. 8. ISBN 9780873493369. Retrieved 20 August 2014. ^ Sealey, Mike. "AMC V8 Engines". allpar.com. Retrieved 20 August 2014. ^ a b "Gray's new 327-cubic inch Fireball V8". The Skipper. 19: 15. 1959. Retrieved 20 August 2014. ^ a b Auto Editors of Consumer Guide (22 August 2007). "Rambler Measures Up". howstuffworks com. Retrieved 20 August 2014. ^ Ingraham, Joseph C. (24 March 1957). "Automobiles: Races; Everybody Manages to Win Something At the Daytona Beach Contests". The New York Times. p. 153. Retrieved 20 August 2014. ^ Holder, William; Kunz, Phil (2006). Extreme Muscle Cars: The Factory Lightweight Legacy. Krause Publications. 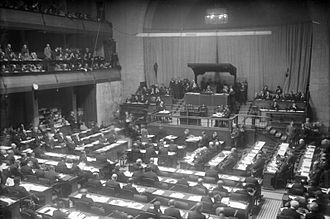 p. 16. ISBN 978-0-89689-278-1. Retrieved 20 August 2014. ^ Glastonbury, Jim (2016). Muscle Cars: Style, Power, and Performance. Book Sales. p. 220. ISBN 9780785834830. Retrieved 1 February 2019. ^ a b Dunne, Jim (May 1966). "V8 for Rambler American". Popular Mechanics. 125 (5): 60. Retrieved 20 August 2014. ^ Potter, Steve (May 1985). "New Indy Engines: from driveway to speedway". Popular Mechanics. 165 (5): 227. Retrieved 20 August 2014. ^ "series Champcar complete". oldracingcars.info/usnc. Retrieved 20 August 2014. ^ "AMC 209 CI project". Track Forum. 2012. Retrieved 20 August 2014. ^ a b Peters, Eric (2011). Road Hogs: Detroit's Big, Beautiful Luxury Performance Cars of the 1960s and 1970s. Motorbooks. p. 98. ISBN 9780760337646. Retrieved 27 September 2018. ^ a b c "Engine application chart". matadorcoupe.com. Retrieved 20 August 2014. ^ Sessler, Peter C. (2010). Ultimate American V-8 Engine Data Book (Second ed.). Motorbooks International. pp. 232–233. ISBN 9780760336816. Retrieved 20 August 2014. ^ The list is compiled from "Performance American Style" (mainly), "American Cars 1946-1975" and various automotive manuals, technical service manuals, published road tests, and AMC's pamphlets. Sessler, Peter C. (2010). Ultimate American V-8 Engine Data Book (Second ed.). MBI Publishing. ISBN 978-0-7603-3681-6. Retrieved 6 December 2012. Ambassador was the model name applied to the senior line of Nash automobiles from 1932 until 1957. From 1927 through the model year, the Ambassador name was applied to a high trim club sedan body style. The Ambassador series was the flagship in the Nash line, Nash Motors first use of the name Ambassador was during the 1927 model year when a specially trimmed four-door, five-passenger club sedan version of the Nash Advanced Six was developed. As the most expensive car in the line, the Ambassador received premium upgrades in upholstery, exports accounted for almost 11% per cent of Nash production in 1927, and the cars were purchased by several royal families. The Ambassador model lost its position as Nashs most expensive car in 1929 with the introduction of seven-passenger sedan, the Ambassador remained in the Advanced Six range until 1930 when the model was moved to the Nash Twin Ignition Eight series. In 1931 the cumbersome Twin Ignition Eight name was replaced by the simpler Eight-90 model designation, riding on 133-inch or 142-inch wheelbases, the Ambassadors featured a 125 hp,322 cubic inches straight-eight engine with twin-ignition and overhead valves. All the cars were sumptuously appointed earning the title of the Kenosha Duesenbergs for their quality, styling, the CCCA has recognized all 1932 Series Advanced 8 and Ambassador 8, as well as the 1933 and 1934 Nash Ambassador 8 as Full Classics. This was part of Nashs second 1932 series, which included completely new bodies, aside from General Motors, Nash was the only automobile manufacturer to make a profit in 1932. For 1934, Nash introduced completely new styling, called Speedstream, featuring use of ornamental moldings in body panels and fenders, in a very streamlined. The Ambassador Eight series for this year was limited to various four-door sedan body styles, the Nash Ambassador 8 now saw new competition with such cars as the redesigned and lower priced LaSalle, Auburn V-12, REO-Royale 8, Buick Series 34-90, and the Chrysler Imperial Airflow. The 1935 model year saw yet another complete re-styling, known as Aeroform, the 1935 Ambassador Eight was now built on a much shorter 125-inch wheelbase, and used the smaller, former Advanced Eight engine. No longer would Nash build the big, classic cars of 1930-1934, in 1937 Nash acquired the Kelvinator Corporation as part of a deal that allowed Charlie Nashs handpicked successor, George W. Mason, to become President of the new Nash-Kelvinator Corporation. The 1937 models saw the return of coupes and convertibles to the Ambassador lines, beginning in 1937, even the low-priced LaFayette series came under this plan. In 1937, Sinclair Oil Corporation teamed up with Babe Ruth in a baseball contest where a 1937 Nash Ambassador Eight sedan was awarded every week, for the 1941 and 1942 model years all Nash vehicles became Ambassadors, and rode both long and short wheelbases. The Ambassador Eight now shared the Ambassador Sixs 121-inch wheelbase, from 1941 through 1948, Nash Ambassador models placed this unibody structure on top of a conventional frame, thus creating a solid and sturdy automobile. It was one of the first in the market segment with coil spring suspension in front and back. In the spirit of wartime conservation, the Ambassador Six and Eight lost their twin ignition feature for 1942, the 1941-42 Ambassador 600 was the only Ambassador ever powered by an L-head engine. Motorcraft is an auto parts brand of American automotive corporation Ford Motor Company. The Ford Motor Company launched this auto parts division in 1972 to provide replacement parts and this brand replaced Autolite as Fords official parts brand. Autolite has continued since and is still a name in use today. Motorcraft was originally launched in the 1950s with and was discontinued after Ford had purchased the Autolite trade name. Today parts are designed and engineered to fit for installation on Lincoln, some parts, such as Motorcrafts extensive list of oil filter applications, fit a wide variety of makes/models not built by Ford Motor Company. Motorcraft products are sold through Ford and Lincoln-Mercury dealerships, as well as auto parts stores. Many times, Ford will approach a contract manufacturer of a particular product and these products must meet quality standards set by the Ford Motor Company to be considered for retail sale. Other brands such as Mazda use Motorcraft products in vehicles which both partner when producing, although Motorcraft can only be contacted through the Ford website, Motorcraft parts and products can sometimes be used on other non-Ford vehicles. In an internal combustion engine, the cylinder head sits above the cylinders on top of the cylinder block. It closes in the top of the cylinder, forming the combustion chamber and this joint is sealed by a head gasket. In most engines, the head provides space for the passages that feed air and fuel to the cylinder, the head can be a place to mount the valves, spark plugs, and fuel injectors. With a chain drive to a camshaft, the extra length of chain needed for an overhead cam design could give trouble from wear. Early sidevalve engines were in use at a time of simple fuel chemistry, low octane ratings and this made their combustion chamber design less critical and there was less need to design their ports and airflow carefully. One difficulty experienced at this time was that the low compression ratio implied a low expansion ratio during the power stroke, exhaust gases were thus still hot, hotter than a contemporary engine, and this led to frequent trouble with burnt exhaust valves. A major improvement to the engine was the advent of Ricardos turbulent head design. This reduced the space within the chamber and the ports. Most importantly, it used turbulence within the chamber to thoroughly mix the fuel and this, of itself, allowed the use of higher compression ratios and more efficient engine operation. Despite common knowledge, the limit on performance is not the gas flow through the valves. With high speed engines and high compression, the limiting difficulty becomes that of achieving complete and efficient combustion, efficient engines thus tend towards the pent roof or hemi designs, where the valves are brought close in to the centre of the space. Where fuel quality is low and octane rating is poor, compression ratios will be restricted, in these cases, the sidevalve engine still has much to offer. Such engines remained in production into the 1990s, only being replaced when the fuels available in the field became more likely to be diesel than petrol. In the overhead valve design, the head contains the poppet valves. In the overhead camshaft design, the head contains the valves, spark plugs and inlet/exhaust tracts just like the OHV engine. 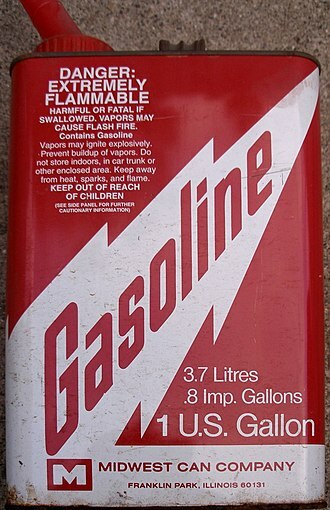 Gasoline /ˈɡæsəliːn/, known as petrol /ˈpɛtrəl/ outside North America, is a transparent, petroleum-derived liquid that is used primarily as a fuel in internal combustion engines. It consists mostly of organic compounds obtained by the distillation of petroleum. On average, a 42-gallon barrel of oil yields about 19 US gallons of gasoline when processed in an oil refinery. The characteristic of a gasoline blend to resist igniting too early is measured by its octane rating. Gasoline is produced in several grades of octane rating, gasoline contains ethanol as an alternative fuel, for economic or environmental reasons. Gasoline, as used worldwide in the vast number of combustion engines used in transport and industry, has a significant impact on the environment. Gasoline may enter the environment uncombusted, as liquid and as vapors, from leakage and handling during production and delivery, from tanks, from spills. As an example of efforts to control leakage, many storage tanks are required to have extensive measures in place to detect. Gasoline contains benzene and other known carcinogens, Gasoline inhalation can produce an intense high, however the practice is thought to cause severe organ damage, including mental retardation. The first automotive combustion engines, so-called Otto engines, were developed in the last quarter of the 19th century in Germany, the fuel was a relatively volatile hydrocarbon obtained from coal gas. With a boiling point near 85 °C, it was suited for early carburetors. The development of a spray nozzle carburetor enabled the use of less volatile fuels, further improvements in engine efficiency were attempted at higher compression ratios, but early attempts were blocked by knocking. In the 1920s, antiknock compounds were introduced by Thomas Midgley Jr. and Boyd and this innovation started a cycle of improvements in fuel efficiency that coincided with the large-scale development of oil refining to provide more products in the boiling range of gasoline. In the 1950s oil refineries started to focus on high octane fuels, the 1970s witnessed greater attention to the environmental consequences of burning gasoline. Packard was an American luxury automobile marque built by the Packard Motor Car Company of Detroit, United States, and by the Studebaker-Packard Corporation of South Bend, Indiana. 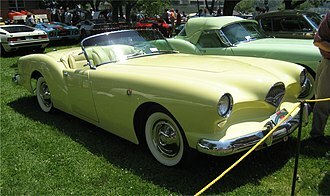 The first Packard automobiles were produced in 1899, and the last in 1958, with one of the last concept cars built in 1956, henry Bourne Joy, a member of one of Detroits oldest and wealthiest families, bought a Packard. Impressed by its reliability, he visited the Packards and soon enlisted a group of investors—including Truman Handy Newberry, on October 2,1902, this group refinanced and renamed the New York and Ohio Automobile Company as the Packard Motor Car Company, with James Packard as president. Alger served as vice president, Packard moved operations to Detroit soon after, and Joy became general manager. An original Packard, reputedly the first manufactured, was donated by a grateful James Packard to his alma mater, Lehigh University, another is on display at the Packard Museum in Warren, Ohio. 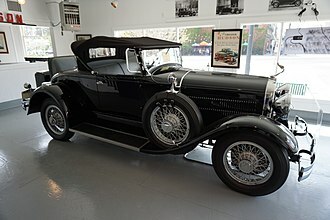 In the beginning, all Packards had a single-cylinder engine until 1903, Packard produced its Twin Six model series of 12-cylinder cars from 1915 to 1923. The marque developed a following among wealthy purchasers both in the United States and abroad, competing with European marques like Rolls-Royce and Mercedes Benz, the 3,500, 000-square-foot Packard plant on East Grand Boulevard in Detroit was located on over 40 acres of land. 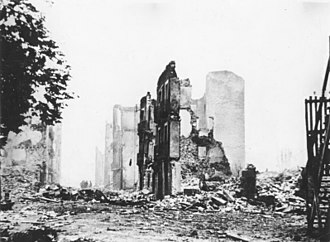 Its skilled craftsmen practiced over 80 trades, the dilapidated plant still stands, despite repeated fires. The factory is in proximity to the current General Motors Detroit/Hamtramck Assembly. 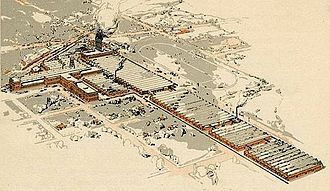 Architect Kahn designed the Packard Proving Grounds at Utica, from this beginning and beyond the 1930s, Packard-built vehicles were perceived as highly competitive among high-priced luxury American automobiles. The company was referred to as being one of the Three Ps of American motordom royalty, along with Pierce-Arrow of Buffalo, New York and Peerless of Cleveland. For most of its history, Packard was guided by its President and General Manager James Alvan Macauley, inducted into the Automobile Hall of Fame, Macauley made Packard the number one designer and producer of luxury automobiles in the United States. An overhead valve engine is an engine in which the valves are placed in the cylinder head. This was an improvement over the flathead engine, where the valves were placed in the block next to the piston. Overhead camshaft engines, while overhead valve by definition, are usually categorized apart from other OHV engines. Lifters or tappets are located in the block between the camshaft and pushrods. By contrast, overhead camshaft design avoids the use of pushrods by putting the camshaft directly above the valves in the cylinder head, in 1900, Marr was hired as chief engineer at the Buick Auto-Vim and Power Company in Detroit, where he worked until 1902. Marr said he got the idea of overhead valves when making the small tricycle engine, marrs engine employed pushrod-actuated rocker arms, which in turn pushed valves parallel to the pistons, and this is still in use today. This contrasts with previous designs which use of side valves. Marr left Buick briefly to start his own company in 1902, the Marr Auto-Car. The OHV engine was patented in 1902 by Buicks second chief engineer Eugene Richard, at the Buick Manufacturing Company, precursor to the Buick Motor Company. The worlds first production overhead valve engine was put into the first production Buick automobile, the 1904 Model B, the engine was designed by Marr and David Buick. Eugene Richard of the Buick Manufacturing Company was awarded US Patent #771,095 in 1904 for the valve in head engine. Arthur Chevrolet was awarded US Patent #1,744,526 for an adapter that could be applied to an existing engine, in 1949, Oldsmobile introduced the Rocket V8. It was the first high-compression I-head design, and is the archetype for most modern pushrod engines, general Motors is the worlds largest pushrod engine producer, producing both I4, V6 and V8 pushrod engines. Nowadays, automotive use of side-valves has virtually disappeared, and valves are almost all overhead, most are now driven more directly by the overhead camshaft system. Few pushrod-type engines remain in production outside of the United States market and this is in part a result of some countries passing laws to tax engines based on displacement, because displacement is somewhat related to the emissions and fuel efficiency of an automobile. The Rambler Rebel is an automobile that was produced by the American Motors Corporation of Kenosha, Wisconsin for the 1957–1960 model years, as well as again for 1966 and 1967. Introduced as a model in one body style, the 1957 Rambler Rebel is credited for being the first factory-produced intermediate-sized high-performance car. This became known as the car market segment. It was to be among the earliest production cars equipped with fuel injection. 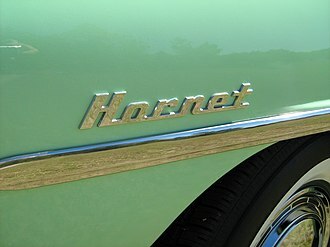 The second and third generations essentially became the equivalent Rambler Six models, the Rebel nameplate was reintroduced in 1966 as the top-line intermediate-sized two-door hardtop. For the 1967 model year, AMCs all-new intermediate line took the Rebel name, American Motors dropped the historic Rambler marque from these intermediate sized models to become the AMC Rebel starting with the 1968 model year. 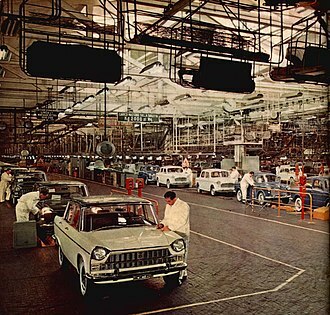 The cars were produced in Argentina by Industrias Kaiser Argentina. The legacy large-sized Nash and Hudson models were suffering from dwindling sales in a marketplace where consumers were only offered large-sized sedans, the new Rambler was designed to split the market wide open with a mid-size model that featured aggressive styling and plenty of power. Development of AMCs new overhead-valve V8 engine began in 1955, under the chief engineer, Meade Moore. The new engine evolved because component sharing relationships with Packard were terminated, the new engine debuted in mid-1956 in the Nash Ambassador Special and the Hudson Hornet Special. At that time, the 250 cu in engine was the smallest American V8, the 1956 model year four-door Rambler models were completely redesigned. Edmund E. Anderson and Bill Reddig styled the new model with a dramatic reverse-sloped C-pillar as well as borrowing the Nash-Healeys Pinin Farina-designed inboard, for the 1957 model year the Rambler was established as a separate marque. The 1957 Rambler Rebel debuted as a model in the Rambler line showcasing AMCs big new V8 engine. The Rebel became the first factory-produced lightweight muscle car, American Motors surprised most observers with the December 1956 introduction of the Rambler Rebel – a veritable supercar. The new 1957 model debuted as a vehicle that combined AMCs lightweight 108-inch wheelbase Rambler four-door hardtop body with AMCs newly introduced 327 cu in V8 engine. On the left, the brass oil drain connection. On the right are the braided oil supply line and water coolant line connections. Compressor impeller side with the cover removed. Wood is one of the first fuels used by humans. Colombo Type 125 "Testa Rossa" engine in a 1961 Ferrari 250TR Spider with six Weber two-barrel carburetors inducting air through 12 individual air horns, adjustable for each cylinder. Gaskell Romney, sitting, and family, of Colonia Dublan, Chihuahua, c. 1908. Son George is fourth from the left. Range of motor oils on display in Kuwait in now-obsolete cardboard cans with steel lids. 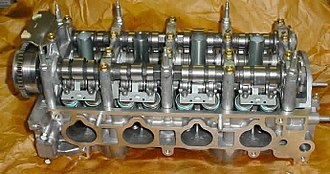 Picture of a V8 engine block (with intake manifold removed), showing the camshaft, pushrods, and rockers. 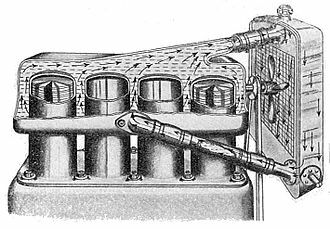 De Dion-Bouton engine from about 1905, in which can clearly be seen a discrete crankcase with upper and lower halves (each a casting), with the bottom half constituting both part of the main bearing support and also an oil sump. Gardner 0 open-crank stationary engine. The connecting rod is enclosed with a simple plate above, as a safety guard rather than an enclosed crankcase. The column-mounted push button selector box for the Touchbutton Ultramatic in a 1956 Caribbean.